The recent snow caused us to be cut-off for 4 days which was super-exciting for all of us. With all three roads into our village blocked by huge drifts we were limited to a radius of around 200m from our house. 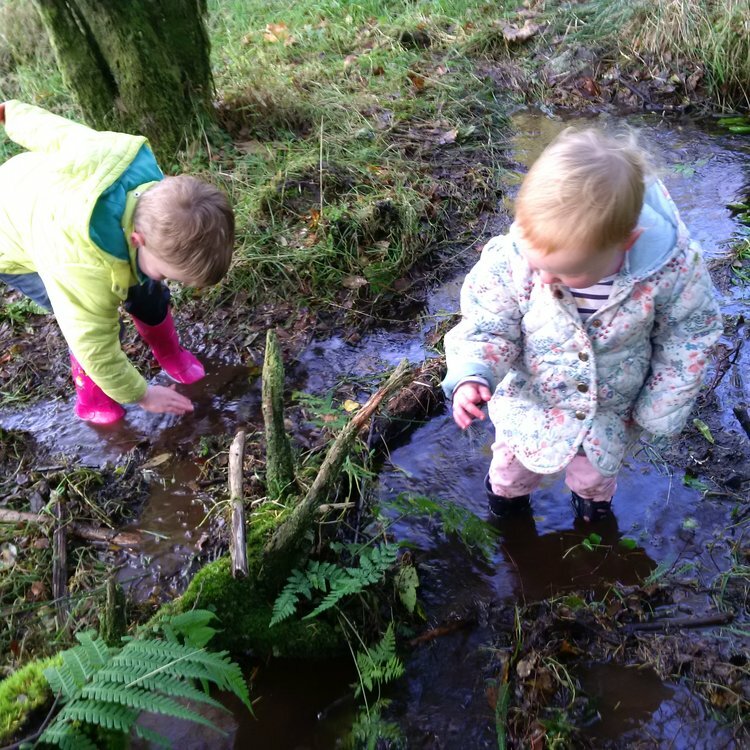 Initially, the prospect of entertaining our children within such a small area and ensuring we all didn’t get cabin fever felt insurmountable, but, we were proved wrong. In fact, what happened was a snippet of times gone by. A time when motorised transport didn’t exist. When days were spent playing in and around the vicinity of the family home. When games and entertainment were what you made from what was around you. Just getting out of the door proved tricky enough! There were some caveats, of course; we had a fridge full of food (thankfully we’d gone shopping the day the snow begun to fall), we had electricity, we had films to watch when it got too cold to be outside, and we had internet connection. So, we weren’t that cut-off at all. Physically getting around, however, was a different story. The first obstacle we had to overcome, once the winds had died down enough to consider going outside, was the sheer depth of snow. 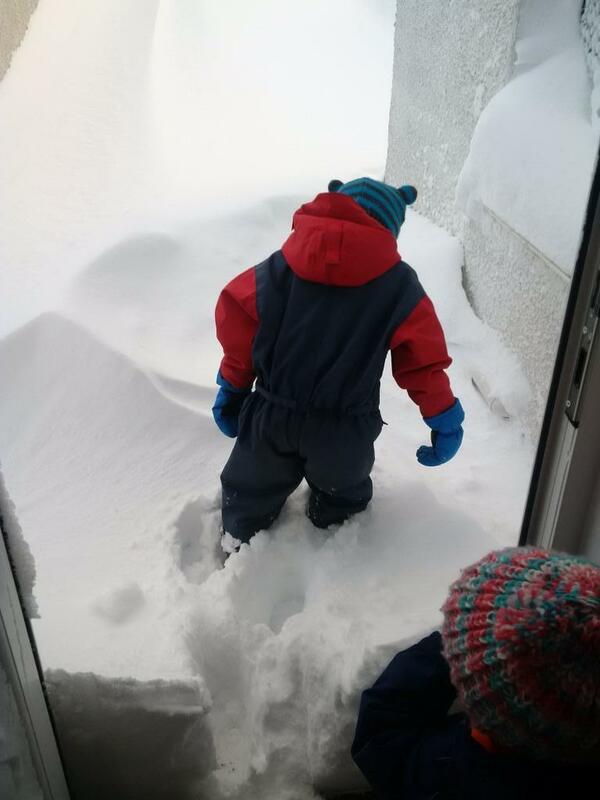 The drifts were up to our waist in places, which was tricky enough for us adults, but for the children that meant a snow depth of chest height – the poor things were literally getting stuck in the snow! After we dug ourselves out of our house – literally – we had to make the best use we could of our sledge to pull our son (4) and carrying our daughter (1) in a fireman’s lift proved the only way to move her without exhausting ourselves in the process. Wading through thick, deep snow while carrying a wee one on your hip is an energy-sapping affair! The extent of our ‘world’ for 4 days, apart from keeping snug indoors, consisted of the 200m walk/wade to the end of our village where progress was blocked due to huge snowdrifts, our back garden and the field opposite our house. Sledging – going in pairs or singly, we found a great run and kept rotating the sliders. 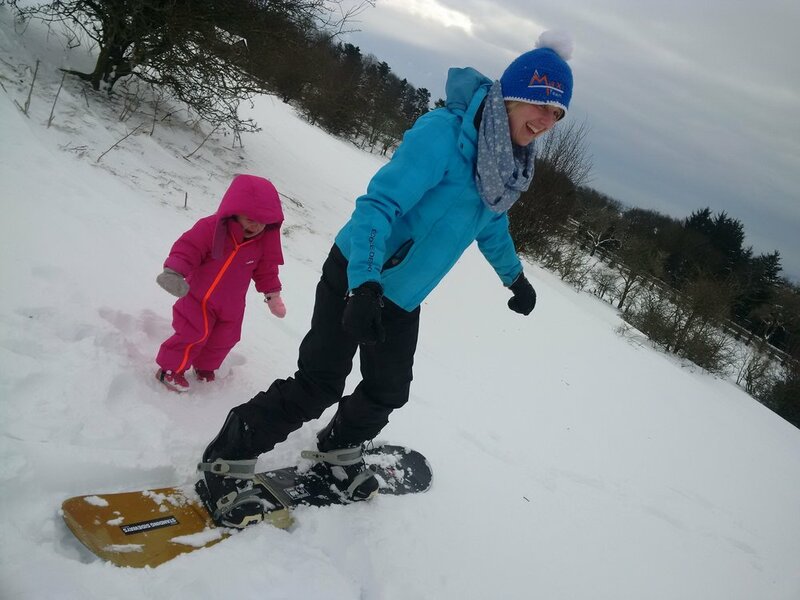 Snowboarding – parents are allowed to have fun too! Sliding – being kitted out in winter suits and waterproofs, we were all as slidy as slidy things, so after finding a nice steep drop, we all had a good go at sliding. Snowmen and igloos are also good fun, but with children as young as ours, they can easily get too cold to enjoy playing with the ‘end product’ as it can take a long time to build. Essential to keeping everyone happy was thermal base layers, thick winter suits a.k.a. ‘zoot suits’ and double socks inside those welly boots. With the right clothes on and the ‘morale boosters’ mentioned above, we were able to play in the snow for over an hour each day. Walking back up to the top of the field every time after sledging down was a mission, given the depth of snow. Not only that, but the biting wind was sweeping across the top too. This meant fruit and chocolate bites were needed to keep everyone’s spirits up and prolong our play in the fields. When it can take well over half an hour to get everything together and everyone kitted up and out the door you need to get as much time out of your trip as possible to have made it worth the effort of getting outside in the first place! This means morale boosters are vital part of your outdoor, winter play kit. Two weary children with rosy cheeks filled with clean, fresh air and fun, exhilarating experiences coursing through their minds with them ready to eat their dinner and flop into bed – Parenting Win! Too right! I thought being cut-off for 4 days with the children would drive me stir crazy. Instead it opened my eyes to see that fun time with the children doesn’t need to have bells and whistles. It doesn’t need an hour’s drive to get there. It can all happen right by your house and all it needs is some motivation (not always easy when it’s cold outside and you’re tired from just being a parent, but worth making the effort if you can), some imagination and a big sense of FUN - if you make it fun, they will most likely have fun and that is what it’s all about. Parents are allowed to have their fun too!